Preparatory drawings, sketches from which artist work up a detailed composition (and in the process sometimes exhibit verve and spontaneity unseen in their finished works) are a delight for curators and collectors. Of Western art, that is. In the Japanese tradition there has been little awareness of the importance to posterity of preliminary drawings, especially in the world of classic ukiyo-e. This, despite the huge initial efforts artists in that genre must have gone through to work out intricate, formal compositions in a tight, prescribed format. With the very notable exception of the Edo artist Kuniyoshi (1797-1861), for whom preliminary studies for some of his 15,000 designs (sic!) survive, there exist today precious few drawings by ukiyo-e school artists. Ironically, the lack of preservation-mindedness in the ukiyo-e world might be attributed to the respect accorded practitioners of zenga (Zen painting) and haiga (haiku painting), fellow artists who were admired specifically for their fluid, hasty, brushwork and seemingly improvised compositions. Or, more likely, print designers simply didn't hold their commercial craft in high enough esteem to worry much about posterity. And then there is the whole issue of the workshop approach to the making of woodblock prints. Fig. 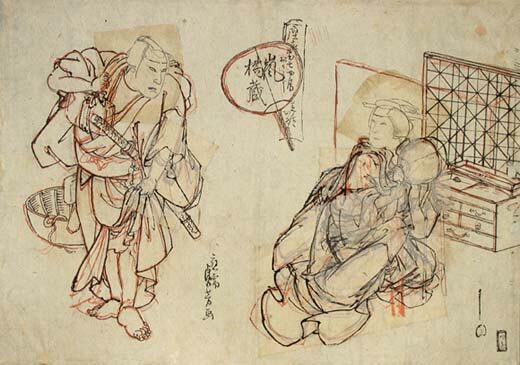 1 is a preparatory drawing (gakô) done just prior to the making of the more detailed hanshita-e. While the hanshita-e — the final drawing that is pasted face down on the block of wood and then sacrificed as a guide for carving up the key block — was drawn by a "block-copyist," an individual distinct from the artist, everything prior to that was the responsibility of the artist whose signature appears on the finished print. However, print artists did not work alone. In their ateliers were student apprentices, sometimes a large number, and a great deal of the work, especially in the case of older, more established names, was done by these assistants. The gakô in Fig. 1 (by Utagawa Sadayoshi, an Osaka artist active 1837-53), though sketched like all gakô late in the artistic process after compositional problems had presumably been ironed out, shows a re-thinking of the furniture layout. More interestingly, it betrays the work of several hands and offers insights into the collaborative process in the atelier. It is pretty safe to assume that the fussy red lines were brushed by an apprentice, and probably the heavier black ones, too. It has long been understood that kimono and stage props were largely left to underlings, with the master, as in this case, working on the hands (note the appliquéed papers) and the all-important faces. In fact, Sadayoshi's heads look as if they were prepared separately and then fitted into areas left blank at the top of the torsos. In other words, even in the low voltage world of Osaka print-making, an artist like Sadayoshi (himself not a major player, and probably not overworked as we know only several score of prints by him) parceled out a substantial portion of this print's design work to his staff. This could have something to do with the nature of this particular kabuki performance — the actor named on the fan, Arashi Tetsuzo, worked only in the less fashionable middle theater of Osaka Kabuki, and this performance took place at Zama Shrine, a low-end venue that was rarely covered by the print publishers — but most likely such a division of labor was typical of almost all prints. Nonetheless, the print produced from this gakô (unknown to us) was probably elegant and gorgeous in the inimitable ukiyo-e way, and for this we must thank the artisans further down the assembly line: the immensely talented but rarely acknowledged block copyists, carvers and printers who could turn the brushwork of students into graceful art. This article originally appeared in Daruma, no. 22, Spring 1999. Copyrighted © text and pictures reprinted with permission.